So you think being the sideline television reporter for the NBA champs is all glamor all the time? Then you haven’t seen the dank little “hidey hole” in which MAXX Client Kerith Burke hangs out during Warriors games at Oracle Arena. When she’s not delivering on-air reports or interviewing players, Burke, who is in her rookie season with NBC Sports Bay Area, spends plenty of time hunkered down just beyond the baseline and below the stands. Envision the cupboard Harry Potter occupied under the stairs in the Dursleys’ home and you get the general idea: It’s a dark and cramped space where she can only see the game on a 14-inch monitor perched on a fold-out table. Occasionally, peanut shells rain down from above and she has been known to rescue cell phones that fans have fumbled. The worst part? The temperature. But a few goosebumps and peanut shells aren’t about to get Burke down. This, after all, is a woman who not long ago was bagging groceries just to pay the rent. Now she owns one of the most coveted jobs in sports broadcasting — assigned to a star-studded, world-renowned team that has captured two NBA titles in three years. So far, Burke, who replaced fan favorite Rosalyn “Ros” Gold-Onwude, has been getting positive reviews from not only Dub Nation, but the people she covers and works with. Burke’s play-by-play partners apparently are just as impressed. Bob Fitzgerald raves about her work ethic (“She’s really diligent and on top of everything she needs to be to cover this team”), and Jim Barnett talks of her on-air composure (“It’s easy to see that the camera really likes her.”). 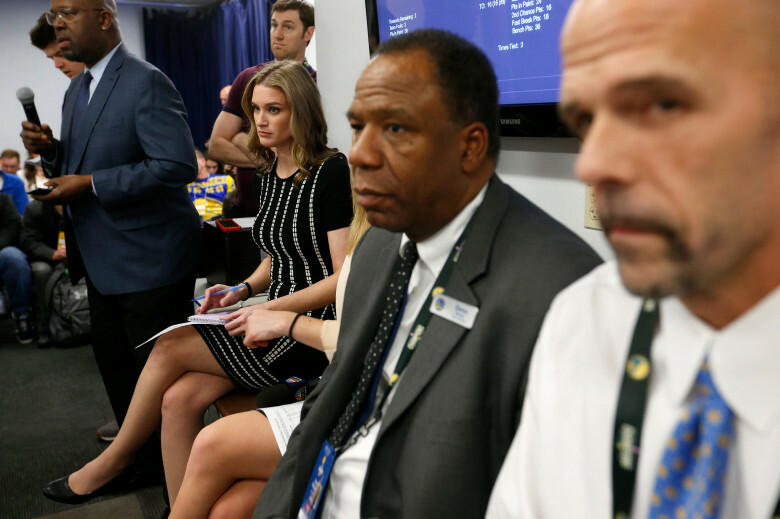 With her stout resume, Burke, who had covered the U.S. women’s basketball team during the 2016 Olympics for NBC, believed it wouldn’t be difficult to find another job in sports journalism. But she found herself scrambling for freelance gigs, including some work with the Pac-12 Network. As her savings dwindled, she tried to hide the struggle from her friends. “I don’t really think that it’s special that I took a job at Whole Foods,” Burke says. “Millions of Americans are doing what they need to do to pay the bills. But it was a good moment to reflect and remind myself that there’s nothing beneath me. Her style apparently includes a dogged commitment to the job. On Wednesday, Burke maintained what is a typical home-game schedule, leaving her apartment in San Francisco at 9:45 a.m. to make the Warriors shoot-around. There, she interviewed Kerr and a few players before co-hosting “Warriors With You,” a Facebook Live show geared toward fan interaction, with Monte Poole. Then it was back across the bridge to grab lunch, change clothes and do her hair and makeup for that night’s telecast. 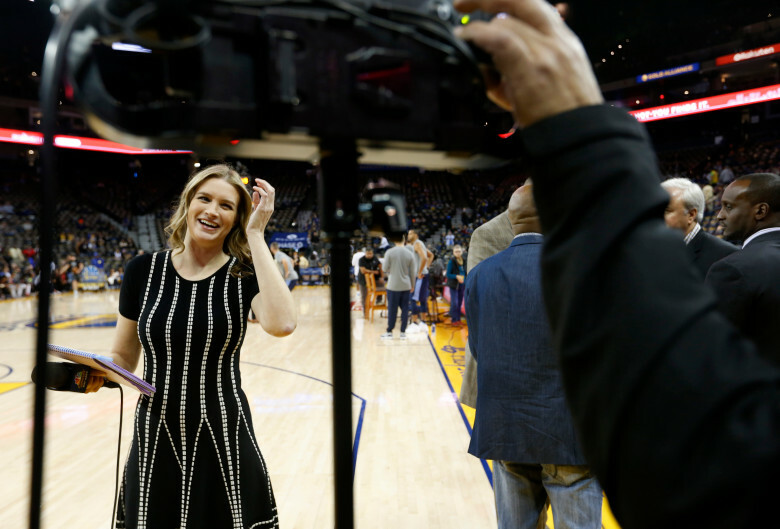 By 3:30 p.m., she was at Oracle Arena to meet with production staff, shoot segments for the pre-game show and attend Kerr’s pre-game press conference. After the game and all the sideline and press-conference duties that entails, she was back on the road shortly after 11 p.m. and headed home. Kerr, who has experienced his share of TV work, says it’s a tougher job than some might think, and Burke has a good handle on it. NBC Sports Bay Area sideline reporter Kerith Burke interviews Golden State Warriors' guard Klay Thompson after Wednesday's game. Kerith Burke works under the stands at Oracle Arena. — No relation: Some basketball fans have assumed that Kerith is the daughter of Doris Burke, the veteran ABC and ESPN basketball analyst. Nope, but the younger Burke is a big fan. — Go, Cougars: Burke and Warriors guard Klay Thompson share the same alma mater. They both attended Washington State University. — Winning ways: The Warriors aren’t the first championship team Burke has been around. With SNY, she covered perennial women’s college basketball powerhouse UCONN for several seasons.